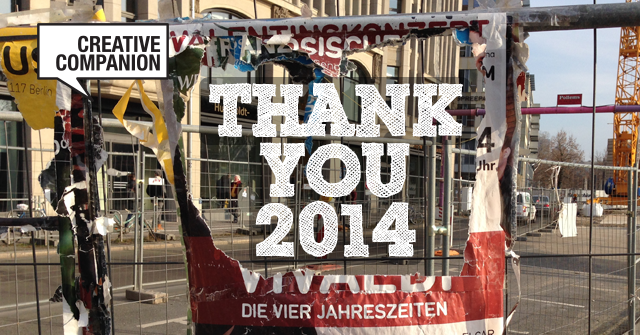 Oh what a year – Thank you 2014! This was a year with many faces and to summarize these 12 months in one sentence would be something like this: a Year of Empathy, Collaboration, Music Thinking and Brand Development from a Service Design point of view. For the fashion brand Olsen in Hamburg (Germany) I developed and designed the reality persona’s, based on research in Canada and Germany. We also worked with my brand strategy framework The Company Real Score to map the most essential brand assets as input for the brand deck. The Übersee-Museum in Bremen (Germany) asked me to do a persona workshop with information on a one year visitors research to make strategic decisions. Together with Design Thinkers Academy I developed a one day course of Service Design Thinking Fundamentals, a crash course with the basic instruments like stakeholder mapping, value network mapping, persona and customer journey. The next course will be in march 2015. A sonic branding project: Massive Music in Amsterdam (Netherlands) asked me to help the team with my expertise in musicology and brand strategy. A nice combination of skills. But there were more music and brand related activities: this year I started in Nijmegen (Netherlands) with a 20×20 (pecha kucha) presentation about Music Thinking and the platform MusicThinking.com, followed by a presentation in Cologne (Germany) about the same subject. Together with Lutz Hempel from ICG, I did a short Music Thinking exercise during the ICG Change Management Seminar in Düsseldorf (Germany) and a full Music Thinking / Jazz it! workshop presentation in Copenhagen (Denmark) during the Art of Management in Organization conference. For Bovemij I did the keynote presentation on their connect event in Utrecht. I showed the development of the last 30 years in the music business and how this connects with the challenges of the world we are living in today. The event was organized by my network partner Gerard Scheenstra of Innovatie Vitamine. With my friend and network partner from the Witten School of Management Stefan Günther I did a workshop based on agile project management for Heraeus in Hanau (Germany); we also advised the board in taking steps towards a scrum framework. For Simon Weber and Friends, Berlin (Germany) I facilitated the alumni meeting with 150 people in Berlin with 10 iPads for the workshop presentations and created the Systemiker-Map to visualize the region they work and their expertise. The Efteling – the Dutch love brand number one – asked me to help them translate their massive research activities in a decision making instrument for a better way of collaboration between marketing and design. 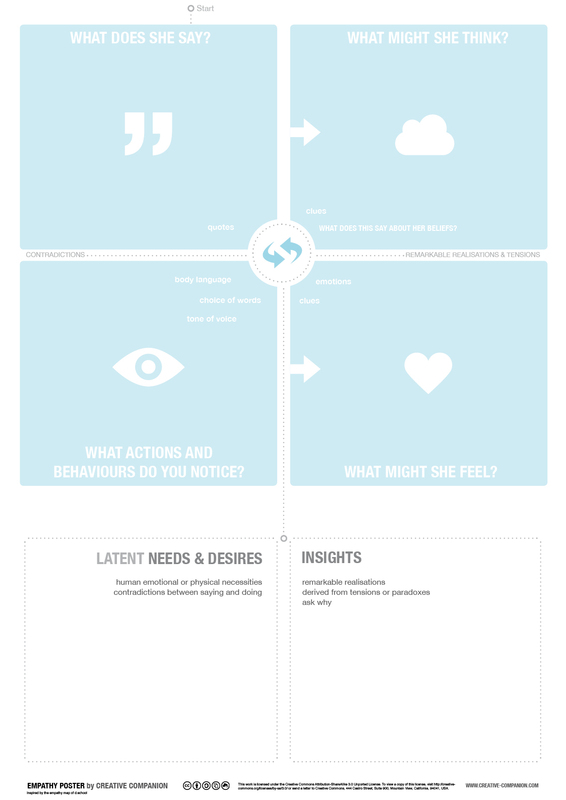 We worked with reality personas based on a big amount of research data and also worked with the design team on aspirational personas to strengthen the brand perspective in daily decisions. I did the design of the reality personas and all workshops and work sessions with the creative team and strategic marketing. For De Rechtspraak in Utrecht (the Dutch Judiciary / Council for the Judiciary) I worked as UX Lead on a quality and innovation project about digital accessibility with a user-centered design approach to let different parties work together in building a user interface with a great user experience. Here are some steps we took: defining ux principles, persona development, customer journey mapping, facilitating creatives and management, usability testing. Thanks a lot to everyone who made this year a fantastic and pleasurable time. I enjoyed to work with you together and I am looking forward to a very nice next encounter. Inspired by the d.school’s empathy map I designed a poster that can be used in focus group meetings or any other research or interview situation. While asking questions and observing behaviour like body language, tone of voice or choice of words it is important to note everything that occurs in the session. In a second step, or during the session you will encounter contradictions (maybe already in saying), between what people say and what they do. Any contradiction or paradox can lead to a (latent) need or desire. If you ask yourself (or the participant) ‘why the things are as they are’ you may come to remarkable realizations or even an epiphany. This will be your most valuable insights. 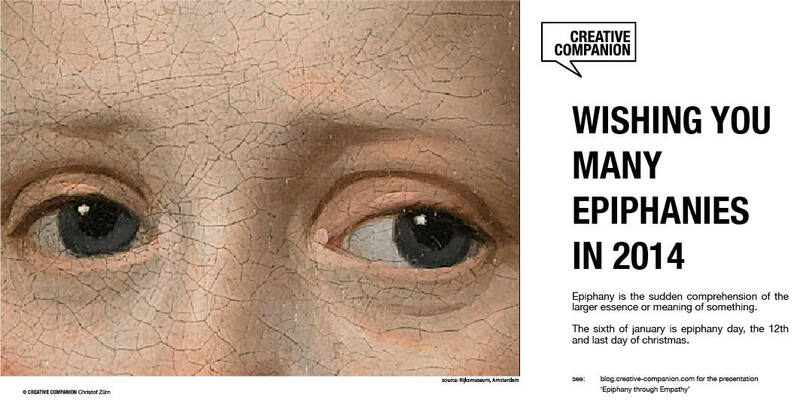 Download the PDF version of the Empathy-Poster by CREATIVE COMPANION. You can print the poster in A4, A3 up to A2 and use it in different situations and workshop or research settings. If you want to map your whole brand input and compare it with the reality persona you could also use The Company Real Score a strategic framework for brand innovation. You can also download the original poster. PS: yes you can use the posters free of charge and yes I would be happy if you give me some feedback, credits or just spread the word! Epiphany through Empathy – wishing you many Epiphanies in 2014! The sixth of January is epiphany day – the 12th and last day of Christmas. The holiday season is over and we can focus on the coming year. A good moment to wish you all the best for 2014! What epiphanies would we get, if we could see through the eyes of another person? I made a presentation under the title ‘Epiphany through Empathy‘ and hope you will like it. Good luck, health and I hope you will have many epiphanies in 2014! Last year I had the pleasure to work on interesting projects with nice people. As Creative Companion I worked for Vlisco on several projects with the focus on ‘Vlisco Stories‘, prototyping ‘iPad in the flagship store’ and a personas / brand related intranet platform. For the fashion brand DEPT I worked on the development of aspirational and reality persona to sharpen their customer centered and brand related strategy. We could present our new product ‘Pfitz – wall object and baking dish‘ at Fuori Salone during Milan Design Week and we found a new manufacturer in Germany. So it will be ‘Dutch Design – handmade in Germany’ very soon. And Pfitz is available in the heart of Amsterdam at Dutch Design Year. Finally the Executive App of NIBE-SVV was launched together with the top of the dutch financial world. The 1PLACE.ME iPhone and Android App was launched and I did the initial social media activation. Working together with Design Thinkers at Bosch in Germany on a Service Design project. During Dutch Design Week I teamed up with FRD and gave a lecture on ‘Persona in the HR field’. I also launched The Company Real Score – a Music Thinking approach to Business Innovation. My daughter and I designed a prototype of a lamp inspired by Mart van Schijndel’s ‘Delta Vase’. The exhibition was shown at Design Perron during Dutch Design Week in Eindhoven and in the Amersfoort Rietveld Pavilion in December and January. Became Member of the Faculty at Witten School of Management in Witten Germany. Started a persona development project for ‘the dutch love brand’ de Efteling. End of the year I developed the online strategy based on The Company Real Score for Hekwerk Theaterprodukties, the management (impressariaat) of dutch cabaret stars like Youp van ’t Hek, Jochem Myjer, Droog Brood and more. Thank you all for working together and the nice time we spent. Curious what 2014 will bring. To learn from music is one of the aspects of Music Thinking. Here are some learnings that could be used as input for some methods I am using for Brand development and Service Design like Persona Creation, or working with The Company Real Score. So with your next persona creation or service design project you maybe would like to ask your audience what kind (or maybe a combination) of music they prefer. This could help to understand your target group better. 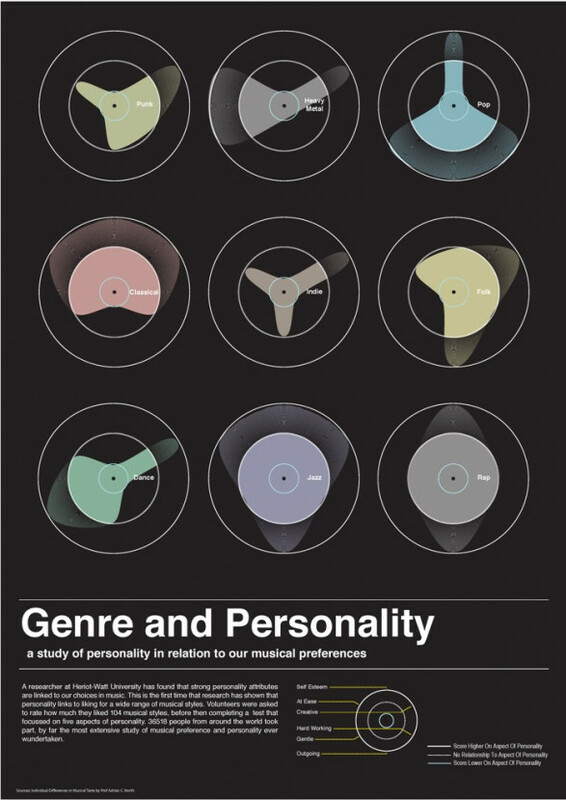 Knowing whether a person prefers John Coltrane to Madonna, Dolly Parton to DJ Avicii, or Wagner to Prince allows for remarkably accurate personality predictions. According to a study with 36.000 participants all over the world (conducted by Professor Adrin North of Heriot -Watt University, Edinburgh) there is a clear correlation between the musical taste of a person and their personality. People could make accurate judgments about an individual’s levels of extraversion, creativity and open-mindedness after listening to ten of their favorite songs. Extraverts tend to seek out songs with heavy bass lines, while those who enjoy more complex styles such as jazz and classical music tend to be more creative and have higher IQ-scores. North, A. C. and Hargreaves, D. J. (2008). The social and applied psychology of music. Oxford: Oxford University Press. North, A. C., Desborough, L., and Skarstein, L. (2005). Musical preference, deviance, and attitudes towards celebrities. Personality and Individual Differences, 38, 1903-1914.